chumby is an inexpensive, Wi-Fi enabled content delivery device designed to be used around the home to display a set of user-customizable widgets – small Adobe Flash animations that provide real-time information, such as weather, stock quotes, RSS feeds, or pictures. The chumby is architected to be as open as possible for users, including hardware hackers, open-source software programmers, and artists, who may want to modify any aspect of the device. 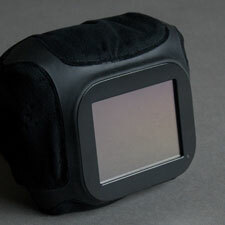 Primary features include an ARM-based microcontroller running Linux, a 3 1/2 inch, 320 x 240 pixel QVGA TFT LCD with integrated touchscreen, stereo speakers, an internal resistive bend sensor (for squeeze-based user interface features), and external headphone and USB connectors. The unique chumby housing is soft and malleable, similar to a plush toy, and allows for removable core electronics. Grand Idea Studio contributed to chumby’s electrical design, mechanical engineering, and housing assembly processes.